Straight from the Golden Mile, Intersection Winery is joining us in April to offer a taste of their small-lot wines. Founded in 2009 and producing just 3,000 cases of wine per year, Intersection farms a 10-acre vineyard planted at high density on Oliver’s Golden Mile. Grapevine varieties are matched to the varying slope, aspect and soil composition to allow even ripening and honest expression of fruit flavors and aromas. The vineyard is cultivated with natural, sustainable, and organic farming techniques. Late last year the Axiom​ was highly-ranked in last year's "Judgement of BC" tasting and fared better than many international reds from Bordeaux and beyond (including some local big-wigs). The Riesling received a Double Gold Medal at the 2017 Cascadia Wine Competition, and the Viognier-Marsanne was named Judge's Choice at the 2018 Vancouver International Wine Festival Vintner's Brunch - so this winery clearly excels across styles and varieties! REMINDER: The 2019/2020 membership year begins April 1st, your membership will need to be renewed before purchasing tickets for this event. Price: Members/Guests $39/$55 by PayPal, E-transfer to info@bcwas.org, or cheque (mailed to BCWAS, P.O. Box 48912 Bentall Station, Vancouver, BC, V7X 1A8). Please e-mail us if paying by cheque so we can hold your spot. 2019 BCWAS membership: Join us now, and your membership is good until March of 2020. Only $40 for more than a year of our fun and fabulous events! Click here to become a member of the best wine club in town. Please note that there are no paper tickets for our events. Once your purchase is completed you will be added to our attendees list. Please check in when you arrive. We are unable to provide refunds: if you purchase a ticket but cannot attend the event, please let us know with as much advance notice as possible and we’ll try to re-sell your ticket, but we cannot guarantee this. Our past double-blind tastings have included Syrah, Cabernet Franc, Pinot Noir, Riesling, and Merlot. This year we’re putting another white wine to the test! Come join us on Monday, March 18th as we taste ten very special BC expressions of the Chardonnay grape. What’s a double-blind tasting? It’s where all the wines are wrapped in paper bags and poured in random order – even we, the organizers and pourers, will not know which wines are which. Why Chardonnay? This noble variety of Burgundy has spread across the entire globe's winemaking regions and is one of the defining grapes associated with wine culture. The relatively neutral grape can be vinified in multiple ways and is said to express terroir particularly well. Chardonnay's popularity has made it vulnerable to excessive commercialization, and mass-market examples with little character sparked the "Anything But Chardonnay" movement that turned off a generation of wine drinkers. Modern Chardonnay done well is far removed from the over-oaked wines of the past, and can be an enthralling experience to taste with myriad sublime food-pairing opportunities. Our Cellarmaster has spent the last year hunting down and bottle-aging top examples from multiple sub-appellations throughout the Okanagan and Similkameen Valleys to ensure a broad representation of BC terroir, which is particularly well suited to Chardonnay. This year's blind tasting will be unique in that it encompasses a single vintage, so as to better compare and contrast different Chardonnay from the high quality 2016 harvest. These Reserve-tier premium Chardonnay have amassed a slew of awards that include a Gold Medal at the Chardonnay du Monde competition, multiple Gold and Platinum medals at the National Wine Awards of Canada, and other prominent medals at competitions such as the Decanter World Wine Awards. If you’ve never been to a blind tasting before, why not make this your first one - particularly if you think you don't like Chardonnay! It’s fun to think about what you’re seeing, smelling, and tasting, and why you like or don’t like what’s in the glass. The Water Street Cafe is very graciously offering a three-course fixed menu for BCWAS members and their guests who would like to come in for dinner before the blind tasting - all for just $35! Please call the Cafe directly to make a reservation: 604-689-2832. Don’t forget to mention that you are with the BCWAS group. Please plan on seating for dinner no later than 6pm in order to finish on time for our tasting. Price: Members/Guests $49/$64 by PayPal, E-transfer to info@bcwas.org, or cheque (mailed to BCWAS, P.O. Box 48912 Bentall Station, Vancouver, BC, V7X 1A8). Please e-mail us if paying by cheque so we can hold your spot. What’s included? A selection of wines from 15 wineries, a selection of appetizers, a chance to meet and chat with winery owners and representatives, and time to hang out with fellow wine lovers in a beautiful, artistic space! Please send us your Twitter handle for our name tags. Please note that there are no paper tickets for our events. Once your purchase is completed you will be added to our attendees list. Please check in when you arrive. Join us to launch Wet February! As we have limited quantities of each bottle, we’re setting up three tables with eight wines each. You can choose four wines from each table for 12 samples, as usual. Don’t worry - everyone will have a fantastic tasting! We’ll make sure that each table has a broad selection of fabulous wines to try. As the guest list grows so too will the number of wines, we have more lonely singles in the cellar looking for love! 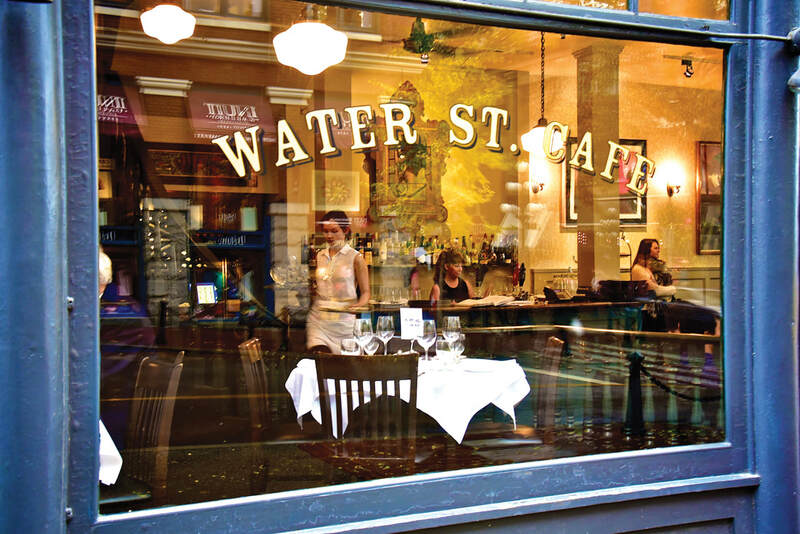 Also, what better place to have an intimate walk-around than the Water Street Cafe. The Cafe is very graciously offering a three-course fixed menu for BCWAS members and their guests who would like to come in for dinner before the event - all for just $35! Please call the Cafe directly to make a reservation: 604-689-2832. Don’t forget to mention that you are with the BCWAS group! ​Sound interesting? Book now and get in on closing “Dry January” for 2019! It’s reasonably inexpensive for what you’re going to get and above all - think about it – you’ll have the chance to delight your palate with a wine that you may never see again. We hope to see you there! It's hard to believe November is nearly over, and the holiday season is fast approaching! The BCWAS welcomes all members and their guests to join a festive social gathering in which to celebrate and wish each other well. Like our annual AGM, this will be a BYOB event - a chance to share a great BC wine you picked up this year! The Society will be providing a selection of cheese & charcuterie, plus hot and cold hors d'oeuvres for everyone to enjoy. Please bring a wine glass if possible, but there will be spares available for those unable to do so. Even better, we have reached into the Society cellar, and our own Cellarmaster has generously donated from his collection, to offer a dozen exciting door prizes - odds are better than 1 in 4! We've also put together an incredible silent auction full of spectacular gift items (for you or your loved ones), including vintage BC Wines and vertical collections from as far back as 2006, with reserve prices starting below original value! A dozen auction items include the following packages: Sandhill Small Lots "Two" 2006, 2007, & 2008; Mission Hill 2008 Compendium & Quatrain; Fairview Cellars 2010 & 2011 The Bear; Culmina Hypothesis 2011, 2012, & 2013; Blue Mountain 2014 Reserve Pinot Gris & Pinot Noir; and Meyer McLean Creek Pinot Noir 2014, 2015, & 2016. Time: 6:30-9:30pm drop-in, but door prizes are announced every ten minutes beginning at 7pm! Directions: The Holiday Social will be held in the same location as our recent AGM, in the Amenity Room of our Cellarmaster's condominium. Attached is a map showing how to find the Amenity Room via the garden courtyard; there will also be a BCWAS member in the building lobby to let you in there. The #15 bus stops on Cambie at 16th Avenue (travels north-south along Cambie from False Creek to Marine Drive and vice versa), and the #33 bus stops in front of the building on 16th Avenue (travels east-west between UBC and 29th Avenue Skytrain Station); transit stops are marked on the map. Price: Only $15 at the door for all members and their guests! Please RSVP to info@bcwas.org so we know how many to expect - the more the merrier! ​Please make sure you have a safe way home: take transit, call a cab, or ask a friend to be a designated driver. We will have free transit tickets on hand for those who take transit home.